How do I shot egg? The thing is, once you see this, you will ever see a damn hole in Brian's nose. birdo is brian in drag! I totally hear the music right now! Can never. Be. Unseen. Evar. "wow birdo is a transfestite" Well, first off, it's spelled 'transvestite'. Secondly, yes. Birdo was cited as a male in the manual for Super Mario Bros. 2 and Mario Kart: Double Dash!! in Japan. 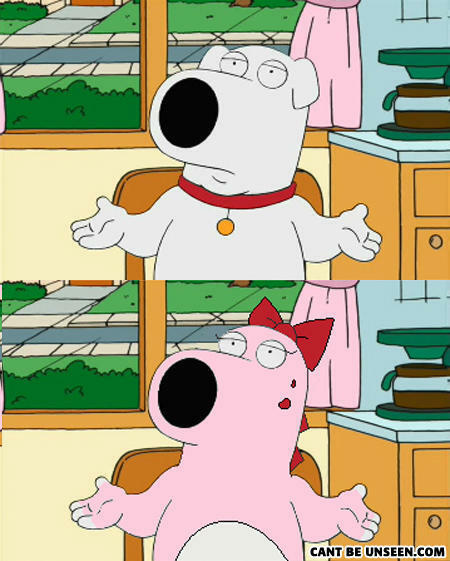 Brian has been dressing out of Stewie's closet again. This one's no good. That's not a picture of Birdo. Someone drew an intermediate character to look like Birdo-Brian. The statement here is "Brian looks like a cross between Birdo and Brian." deli america babas sab abaci remailed its a palindrome .__. OH GOD WHAT HAVE YOU DONE! What's worse then a dead baby?